The first successful sperm cryopreservation was published in 1949 by Polge and his colleagues in livestock. Similar progress was made a few years later in an aquatic species. Since then livestock sperm cryopreservation has developed into a billion-dollar industry globally, evolving from breeder’s clubs and public cooperatives providing artificial inseminations, while sperm cryopreservation in aquatic species remains a research activity with little commercial application. 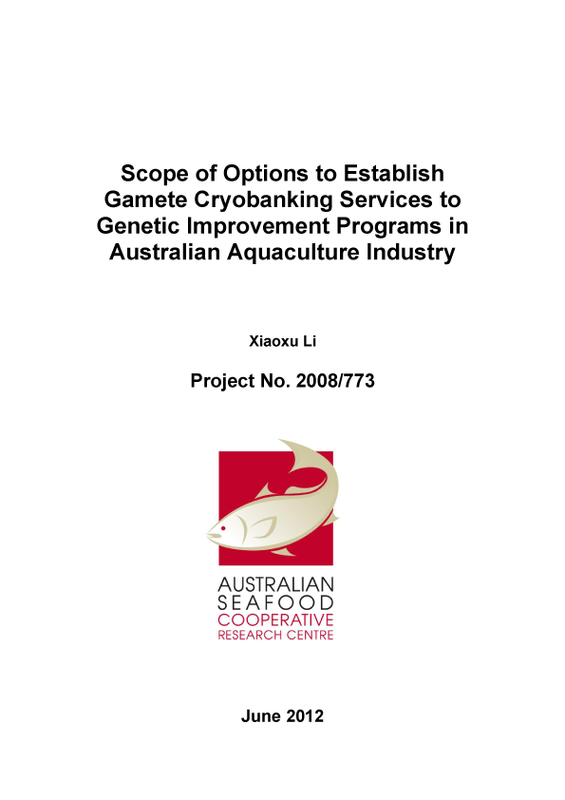 This project focused on scoping the options available to establish a cryobanking service for genetic improvement programs in the CRC which involves cryopreserving a small amount of gametes from the top performing individuals as required by individual breeding programs to form the breeding nucleus. The objective was to establish the short, medium and long term requirements of gamete cryobanking for each CRC partner investing in genetic improvement programs. It was identified that sperm cryopreservation techniques have been published for all species investigated in this study (Atlantic Salmon, Barramundi, Tiger Prawn, Pacific and Sydney Rock Oysters, Greenlip and Blacklip Abalone and Pearl Oyster). Oocyte cryopreservation techniques have been published in Pacific Oysters only. They developed a model to estimate the cost of establishing an onsite cryobanking service (both cryopreserving and storage) with back up storage off site that can be used as a tool to compare and select cryobanking options that would best suit the industries short and long term needs. The key technical gaps in the cryobanking of aquatic species were identified as absence of quality control measures in protocols with published results documenting mean results only, and lack of techniques critical to reconstruct the breeding nucleus. The authors recommended a stepwise approach as the most practical method of establishing gamete cryobanking services for genetic improvement programs in Australia, noting that a new independent facility should not be ruled out if required funding is available.